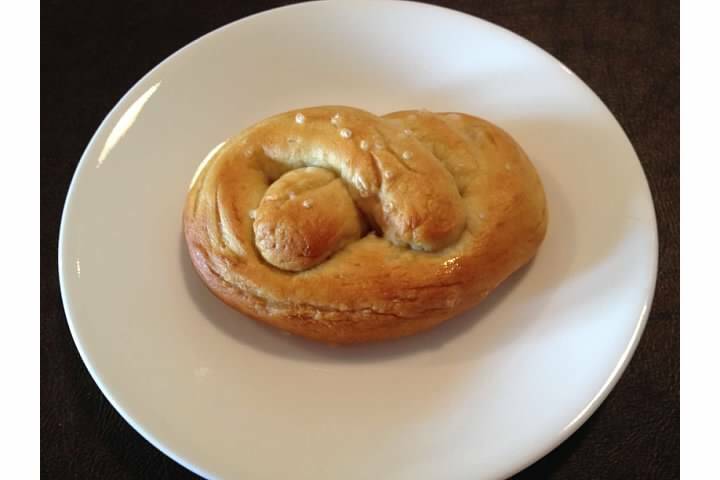 I spent yesterday morning making pretzels with my children, with fantastic results. I need to work on my pretzel formation technique. We used the Joy of Cooking recipe for our basic pretzels. I checked the Joy of Cooking website and the recipe is not available online, and I am not sure about the legalities of sharing recipes from a copyrighted cookbook. So, I encourage you to pick up a copy of the book to find the recipe, and also because it is a very useful book to have in general. I’ve not had a bad recipe from that book yet. For the poppyseed variation I followed the Joy of Cooking recipe through the step where you roll the dough into 12″ ropes. I then melted an ounce of butter, and brushed the melted butter over both sides of the rope. I sprinkled on a cinnamon and sugar mix (1 T sugar and 1 t cinnamon) and poppyseeds, then twisted the rope. I formed the pretzels and skipped the boiling step, putting them directly into the oven for 15 minutes. The result: buttery sugary deliciousness. Pretzels are quite popular in Vienna: they are on the menu in many of the heurigen and breweries, and are available in a lot of the bakeries and street stands. To my surprise, pretzels are even more popular in the area around Salzburg. The breweries that we visited and several take away stands even had a special rack to display pretzels, and I saw a couple street stands devoted solely to pretzels. This past Sunday we went to “Die Salzburger Dult,” a folk festival reminiscent of the county fairs that we have in Virginia. The festival had one of the aforementioned pretzel stands, where I discovered my new favorite pretzel: mohn brezel (poppyseed pretzel). 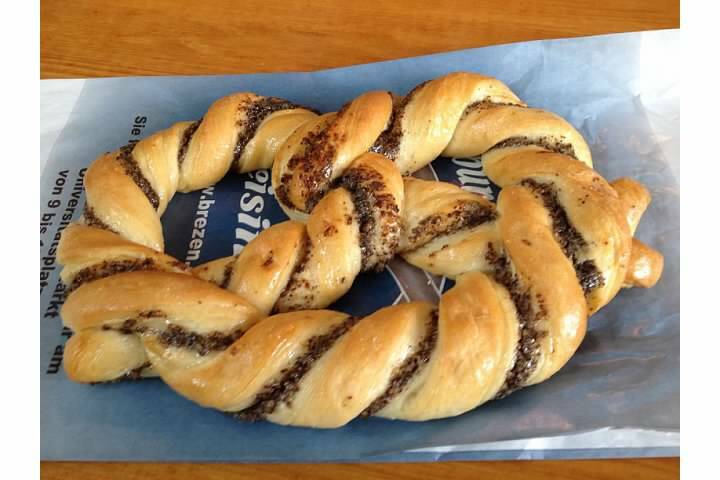 I think it was normal pretzel dough that had been buttered, sprinkled with sugar, cinnamon, and poppyseed, formed into a pretzel shape, and baked. It was so, so good and I am now more determined than ever to learn to make pretzels from scratch. On a side note, all of the “normal” plain pretzels that we ate in the Salzburg area (and that was many) had caraway seeds in the dough. I know this is sometimes the case with the pretzels here in Vienna, but I don’t think it’s as common. 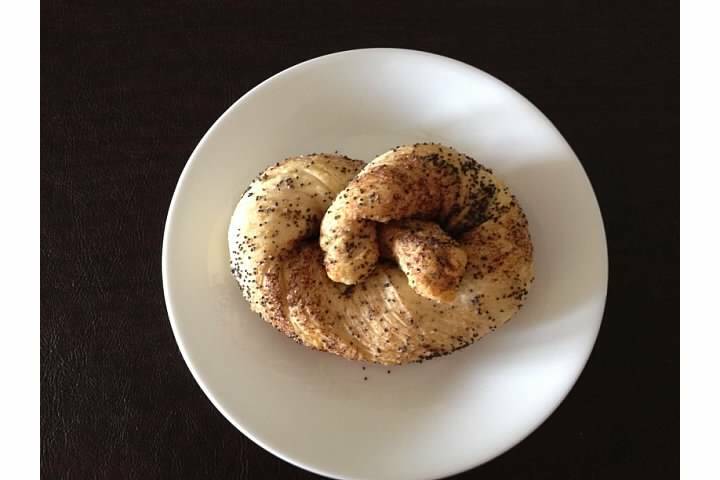 I’m not a huge fan of the caraway seed but my kids are, so once I learn how to do a basic pretzel I will start experimenting with different varieties to include caraway and poppyseed. I hope to do this in the near future, so stay tuned for a base recipe. 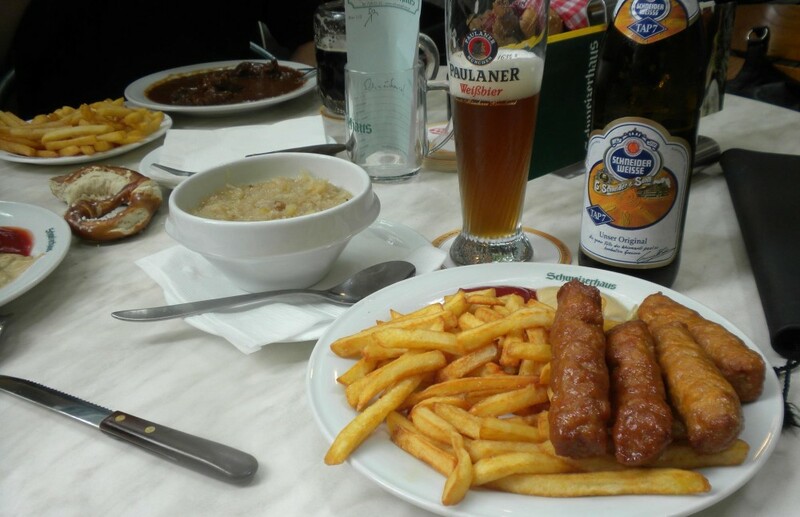 This site’s header photo was taken at Schweizerhaus, the first Gastgarten that we visited in Vienna. The photo includes gulasch, fresh pretzels, and sauerkraut, which are all things that I want to learn how to make. A gulasch that tastes as good as you get in the restaurants here has been particularly elusive to me, so I suppose this would be a good starting point. Stay tuned for a workable recipe!